“These horses have a better life than most humans! They have private grooms, the best tacks, the best bedding and the best feed. Stop attacking good owners!” This is the general response I get when raising any concerns regarding the equestrian ‘sport’ industry. 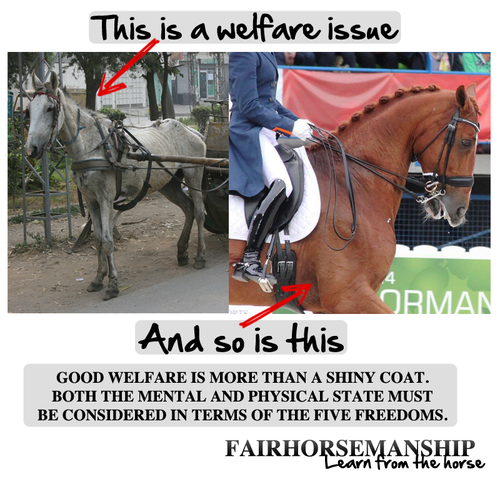 Because in most people minds, as long as the horse is fed and have a shiny coat there is no welfare issue. But welfare goes further than that; both the physical and mental state of the animals must be considered. The Five Freedoms first set out by the Brambell Commission in the 60s form a framework for welfare analysis. 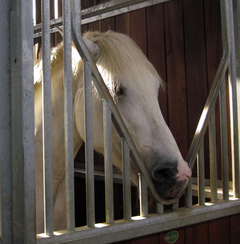 Not only keeping horses stabled most of the day goes against the horse's freedom to act out normal behaviours but the horse can also develop stereotypies. 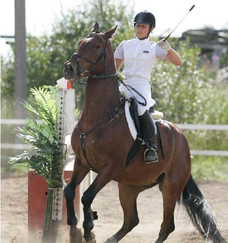 Beating or threatening your horse with a whip is not only unnecessary but it also cause him undeniable fear, distress and pain. But the freedom that I really want to talk about is the last one. Because now this mean, in theory, that if when training your horse you encounter resistance from him, you cannot just threaten him, causing him fear, or hurt him, causing him distress. Doing so will be violating one of the five rights of your horse. You actually have to listen and learn how to do things differently. Unfortunately we all know that there is a big difference between theory and actual application, and that you are unlikely to actually get in trouble for violating this freedom. So it is up to you to stick to a good code of conduct, without the need for legal repercussion. It is up to you to try your best to respect your horse’s five freedoms and educate other around you about welfare.